Recessed Fixed Shelf: At 30" (from floor to top of shelf). All adjustable shelves have 1/2” x 3/4” solid mouldings on front edge. Each Pantry comes with a mounting strip and an anti-tipping strap. 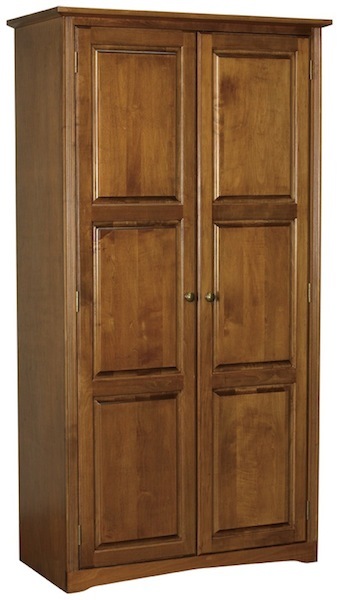 Doors per Pantry: Single Door: 19.5”, 24” Pair of Doors: 24”, 30”, 36” 24” wide Pantries come standard with a pair of doors. A single door option is available; please specify. Single door Pantries are hinged left. Hinged right is an option. Pantries come standard with full height, 3-paneled wood doors. Any of our door styles can be interchanged to create the look you want. Try adding a Roll-Out Shelf to your Pantry. 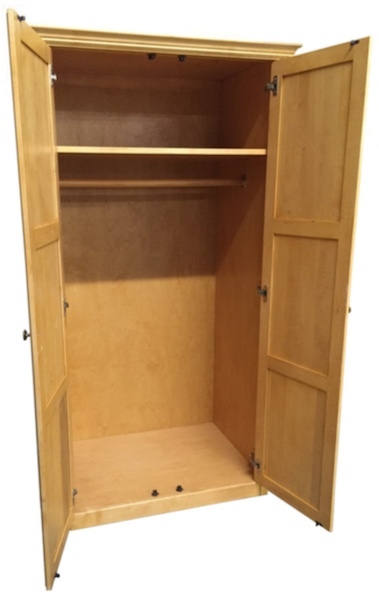 Now you can convert any pantry into a wardrobe for no extra cost! Just indicate the height at which you want the fixed shelf placed. The shelf can be above the hanging bar or near the bottom of the wardrobe.